Do you see this symbol (#) frequently visible on the internet; when you log into Facebook to check out what your friends have been up to and who is going where? Who is talking about what? What’s trending on Instagram and what’s the latest creation on Pinterest? An idea conceived by Twitter in August 2007, Hashtag is doing the rounds on various social media and it’s becoming popular for business use too. Before we talk about why it’s good for business and how businesses can leverage this, let’s see what Hashtags do and why are they useful. Hashtags (#) are designed to create content categories. In simple terms, it can be used as a filter system. It allows people to follow a category / event / discussion / content they are interested in. Hashtags act as a keyword for the topic being discussed. It's nature. Hashtags focus on the “interest graph” instead of “social graph”. Let’s take this example to understand the use of #. You may be connected to a number of friends on Facebook and Twitter, but that doesn’t mean you share the same interest with all of them. By using #, you filter the connections where there is a common interest and then develop a relation or a community to talk about things that matter to you and them. In eCommerce, hashtags are used to optimize search results and attract the target audience. Hashtags can be used to monitor conversations and keep an eye on brands, products, promotions and marketing campaigns. What better way to gain knowledge about products people are interested in and brands that people love and are talking about! Although there are quite a few popular hashtags going around, they’re not necessarily effective for all e-commerce businesses. 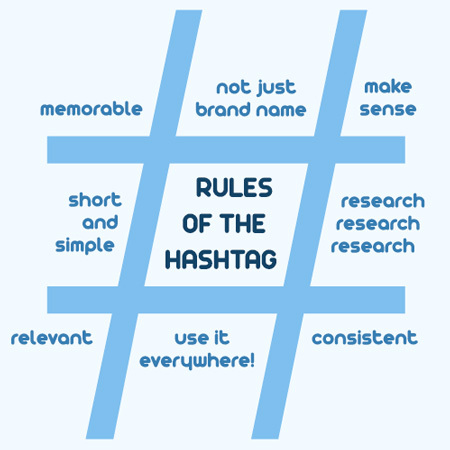 Here are some tips to effectively use a hashtag for your business. 1. Content: The content of hashtag is very important. A hashtag (#) should be followed by letters or numbers and there cannot be any spaces or characters such as ([email protected]$%^&*()<>). Use of any special characters indicates the end of a hashtag. Check out news/industry topics. Identify hashtags that might be relevant to your business/field. Be trendy for the sake of it. Since it is very easy to use a #, you may be tempted to include all the words that come to your mind.But remember, when using #, less is more. 2. Include # in the product description: A smart way to use hashtags is to include them in your product descriptions page of online store and hyperlink that to Twitter. This provides a tangible opportunity to monitor conversations about the product and connects with those who are showing interest. Use relevant # instead of most popular # so as not to be punished as a spammer. 3. Use for Event Marketing: Hashtags are very commonly associated with events. If you are attending or hosting an eCommerce event, get people to tweet about it. It’s a great way to gain exposure for your business and that too through a very targeted audience. Associate these # for a news-related topic as this has to be something specific to be experienced or known about. 1. Search Twitter for trending topics that might be relevant to your eCommerce business or the product you sell. This is especially useful for merchants selling fashion accessories and have a very volatile market environment. 2. Do not stick hashtags at the end of your posts such as product description or event information. This is necessary to remember because if your # is re-tweeted, there is a risk of # falling out of the 140 character limit. 3. Although hashtags come in so handy for SEO, avoid using excessively long hashtags. Your goal must be to get your point across in a jiffy and make it look attractive. Hashtags are new URLs. They have the ability to direct an audience and organize conversations on specific topics, brands, products and ideas. Looking for ways to create your own brand in the hashtag world? Try this. Anyone using a unique hashtag which surprisingly has spur your business? Please share how you came up with that # and what it’s doing for you.